Have you got an Old, Damaged, Unwanted and scrap Car Truck Van or a Ute and Want to get rid of it? 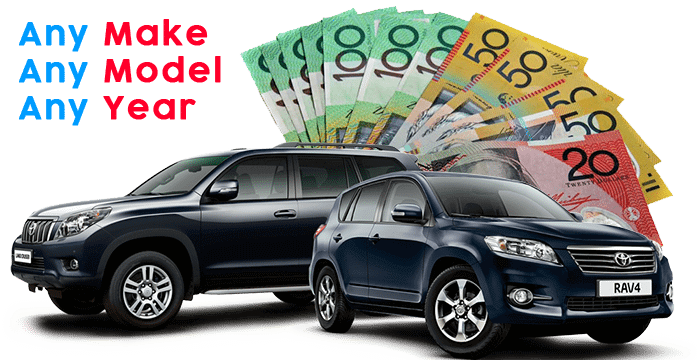 And Get awesome cash for it, well you have come to the Right place.We Remove cars free of any towing fee or Admin fee and offer instant cash of Up to $28,999 on the spot, No Waiting for funds, No Hassle, No Stress that’s why people call us Stress-Free Car Removal. Wreckeroo is a well know brand name for old car removal service across Melbourne and Melbourne Metro areas for a quick car removal and cash for cars call our friendly staff on 0411308262 or fill out our Quick Quote Request Form on the Right Some of our services are outlined below. We buy all makes and models, any age any condition, if you need an old car picked up for cash we have got you covered. We will remove it free of charge from your house or workplace getting rid of that old car sitting for ages and leaving you with cash in hand and more space for your next car. We have a fast and well-educated tow truck operators equipped with Latest Model of Tilt and Slide Tow Trucks they can remove your Scrap or Damaged Car from any corner of your house or Factory. How do we Value your Car? We buy all kinds of Vehicles no matter what age or make is it as mentioned in our Home page we have 3 main sections of business where we process cars we purchase. Please make sure you have the below information handy when you call us or sent us an online inquiry. If your car fits in this criteria we would value your car based upon the scrap metal price we receive from the wholesaler. If your Car or Truck fits this criterion of our industry we would value your vehicle based on the demand for that Make Model and Year. To work out a price we need to know the Make, Model, Year of your car as well as the faults with car, for example, anybody damage Mechanical issues like a Dead engine, Transmission has gone or any other problem it may have. To work out the Quote for you we need to know the Make, Model, Year and Drive type (Auto or Manual) and the kilometres, apart from the above we also need to know if the car has been written off by the insurance company or not, anybody damage etc., in most cases we would ask for a picture of your car sent to us to provide you with the best possible cash rate. With your part inquiry or unwanted car removal need.